Corn is at its absolute peak right now, and we’ve been taking full advantage of the season. Last week we blitzed about thirty cobs to get a small part of the harvest packaged and in the freezer. The boys -and Clara, as she is 18 months-going-on-eight-years and must be involved in anything we do – shucked, and I removed the kernels with my nifty trick involving a bundt pan and a chef’s knife. If you’re wondering what do to with corn, aside from rolling it in butter and sprinkling it with salt, I may have a few good ideas. 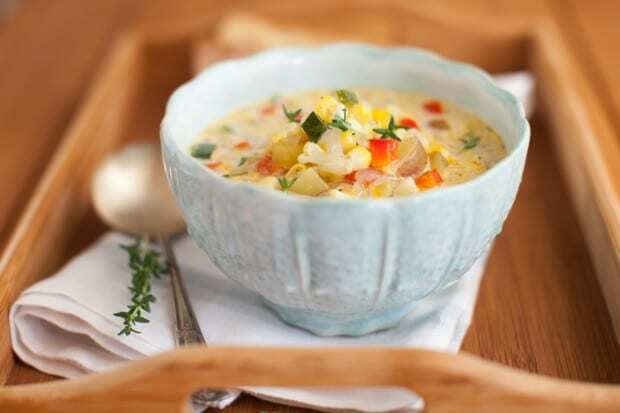 But first, you need to add todays harvest corn chowder to your weeks’ menu plan. This soup is a perfect example of how a homemade stock can enhance a bowl of stewed vegetables and transform it from ho-hum into something truly, well, blogable. In this case, I simmered the typically discarded corn cobs with a handful of aromatics and was left with a rich and slightly sweet corn stock that made up the base of this soup. A splash of cream and a sprig of herbs finished off the dish, and we spooned up the entire pot. The soup is vegetarian and gluten free and can be adapted to be vegan if the cream is replaced with a little coconut or cashew milk. I think either would be delicious. Combine all ingredients and 2 quarts of cold water in a large pot. Bring to a boil, then simmer for 2 hours. Strain stock and cool. Use at once or store for up to 5 days in the refrigerator. Packed with the best vegetables of the season and garden herbs to match, this soup brims with fresh flavours. Peel and dice onion. In a 6-8qt pot, heat olive oil and add onion. Cook over medium heat for five minutes. Meanwhile, slice zucchini into quarters lengthwise and dice. Halve, seed and chop the red pepper. Add the zucchini, red pepper and fresh thyme to the onion. Cook for another five minutes. Pour in the corn stock and add diced potatoes. Simmer for 15 minutes or until the potatoes are tender. Add fresh corn kernels, whole cream and seasoning. Simmer for five more minutes, then serve hot. Garnish with chopped fresh basil if desired. Do you have a favourite recipe for fresh corn? This chowder looks like the perfect summer soup. I love that it has just a splash of cream. And it’s great that you were able to use the corn cobs to make a flavorful stock! We do this to make chicken stock, but we’ve never tried it purely with veggies. Corn chowder was one of my favorite soups that my mom would make when I was growing up! I am not sure that I’ve ever made it for myself though. Totally intrigued by corn stock too. I feel like I’ve been seeing it everywhere lately. This sounds perfect I love that you made your own stock, I have been wanting to do this for way too long and you just gave me the push I needed! So excited to try this! Great recipe and I love the tip for flipping this to non-dairy . I seriously love a good corn chowder – yours looks so plentiful and has got so much flavor!! Yum!! Corn Chowder has to be one of the most comforting meals around. Love!! That is one tasty looking bowl of corn chowder! I like the use of the zucchini! 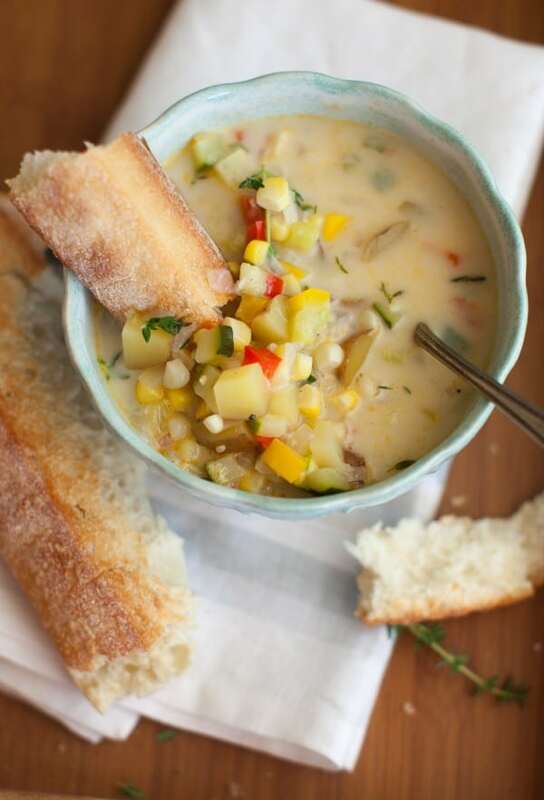 oh I can’t wait to to whip up a batch of this corn chowder! It’s one of my favorite cozy weeknight meals! Such a fun soup, love a good chowder. This is perfect. We’ll be eating this later this week. =) The corn is all ready here and the zucchini and the peppers and everything else…. ;-) Brilliant use of the corn cobs, I just threw them in the compost earlier. Have you ever cooked corn on the cob in a fire? We have one more beach cookout planned and I was thinking of just wrapping them in foil with butter? Sure, Breanne, leave them in their husks, soak them in water for about 30 minutes, then wrap in foil. The moisture will steam them in the fire. Yum! I’ve always wanted to make a corn chowder, but I’ve never gotten around to it. This looks amazing! Going to have to make this when my kids get back from their camping trip. This soup is perfect for the transition into fall! Sweet corn is so good right now! I can’t wait to make this! How is it I’ve never added zucchini to my corn chowder? It’s quite honestly my favorite soup, one of the few meals I could eat repeatedly without getting sick of it. I think I have to make one more batch before the summer ends. Casey’s been talking about corn chowder all summer long. I am now sad that I gave our last CSA corn to our doula over the weekend. Womp womp. I love corn chowder. In fact my summer corn chowder is one of my favorite corn recipes. Corn Fricassee is a close second. I am obsessed with corn right now- I just made chowder the other night, I am going to have to try this recipe next! I made this for supper last night. It was really good! It’s a good soup for this time of year, since all of the ingredients are in season. The things that are not already in my garden are really cheap at the farm stand. This looks fantastic, Aimee! It will be the perfect recipe to use up my remaining corn. Thanks for sharing! Oh goodness, this looks like a bowl of comfort and happiness 🙂 I love it! This soup looks perfect for fall! Homegrown always makes everything taste better. I made this last night and it was delicious! I actually double or tripled the recipe and made a huge pot of it. Since I’m still new to cooking I didn’t know what you meant by “cream” “Whole milk, heaving whipping cream, half and half when I went to the store to find it? I just used half and half and hope that it was okay. It turned out wonderful and I just want to make sure that I can still freeze it with the half and half??? I could eat this everyday is was so yummy!!! I made this yesterday. I prefer broth chowders to thick chowders so I found this to be a wonderfully light and flavourful but satisfying soup.